Although I was first attracted to the Robert Mirabal experience strictly through his MUSIC, I was transfixed by his “Music From a Painted Cave” special on PBS. The visual aspects in the live show adds tremendously to the impact of the music. However, I was curious if seeing Robert live would just be a repeat of the PBS show. Sure, the same songs were played…BUT…the experience was truly unique. Although the stage at the Variety Playhouse was much smaller than the stage used on the PBS video, I was NOT disappointed in the evening’s performance! The four band members slowly entered covered in blankets, sitting on the stage with their backs to the crowd. Robert Mirabal entered, touching each one whom then rose and took their instruments. The show began with “Painted Caves”. Robert then told a story of the ancestors. 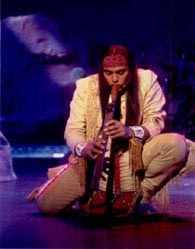 He introduced the next song, “Little Indians”, by telling the statistic of suicide rates among Native Americans. The next song, “Ee-You-Oo” (little boy) was introduced as a ‘song for the children’. Robert then told the humorous ‘blowing tube’ story, talking about the magical powers of flutes told to him by his grandmother. Although he had been told of the enchanting, magical power of the flute over maidens, he pointed out at a friend of his has 15 flutes and is still single! The “Courtship Song” followed, with a captivating dance performed during the song. Robert made a tongue-in-cheek social commentary about how he used to see movies on the reservation, where he “finally got to see a REAL Indian on the screen coming out of their teepees in the desert”! Some people in the audience didn’t get it (Teepees having a totally Hollywood created association with Indians) and he repeated the joke. “Medicine Man”, from the excellent MIRABAL CD followed. The next song, “The Dance” was one of the highlights of the night (for me anyway!). The performance of the song was truly powerful with 5 dancers on stage, 3 in Native American ceremonial dress. Next, Robert told an ancient tale of Apache Raiders and a warrior fight, which was then re-created on stage. The band played a chant & then an instrumental while Robert was offstage (had to be to catch his breath after the intense ‘battle scene’). “Drum Battle” battle followed, with some impressive drumwork! Another grandmother story followed about how he was warned “not to go out a night because of the skinwalkers.” “Skinwalker’s Moon” followed. There was then a 15-minute intermission. The second half of the show began with Robert telling tales of ‘giants that roamed the land’. A giant (actually a man on stilts) entered making the illusion complete with his unearthly speech and the ground ‘trembling’ when he stepped. The chant for Mothers followed, “An Kah Na”. Mirabal then lightened the mood by saying, “thanks for staying. Most people don’t know what to expect at a Native American event. Maybe they feel guilty.” He then delivered a very entertaining monologue about his Grandfather seeing a Scotsman with bagpipes and his Grandfather’s encounter with two Mormons. He then recounted his trip to Russia (from Moscow to Leningrad) and joked about being the token Native American on the trip. The band then launched into “Hope”, with three women dancing on stage. Robert then introduced “1000 Miles” by saying that he would sing the original lyrics about a man dying of AIDS, not the lyrics used on the PBS special. After the song, he spoke of the importance of ‘love’. The whole cast of Mirabal’s show then took a moment of reverie, sitting on the stage. Then slowly, each member arose and left the stage. The original four covering themselves in the blankets as a ‘reverse’ to their entry at the beginning of the show. A short time later, Robert re-entered the stage, spraying the audience with water, a parody of those huge arena-rock shows where the star sprays the overheated audience! He announced they would play “one more song”, and the band launched into a driving version of Jimi Hendrix’ “All Along the Watchtower” (actually a Bob Dylan song that Hendrix made popular). 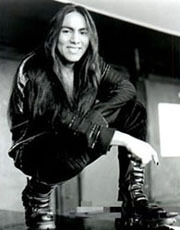 Robert Mirabal stories are an integral part of his live act. He is truly a master storyteller. It is worth the price of the ticket alone just to hear him speak. He has the unique ability to change from humorous anecdotes to serious topics at the drop of a hat. Towards the end of the show, Robert told the audience that they had “experienced a modern day ceremony”. That pretty much summed up the evening’s show!